Here is an original and provocative anthropological approach to the fundamental philosophical question of what makes life worth living. Gordon Mathews considers this perennial issue by examining nine pairs of similarly situated individuals in the United States and Japan. In the course of exploring how people from these two cultures find meaning in their daily lives, he illuminates a vast and intriguing range of ideas about work and love, religion, creativity, and self-realization. 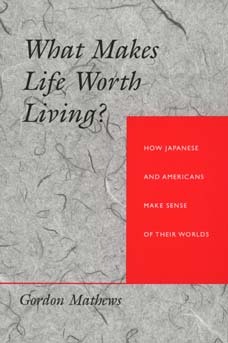 Mathews explores these topics by means of the Japanese term ikigai, "that which most makes one's life seem worth living." American English has no equivalent, but ikigai applies not only to Japanese lives but to American lives as well. Ikigai is what, day after day and year after year, each of us most essentially lives for. Through the life stories of those he interviews, Mathews analyzes the ways Japanese and American lives have been affected by social roles and cultural vocabularies. As we approach the end of the century, the author's investigation into how the inhabitants of the world's two largest economic superpowers make sense of their lives brings a vital new understanding to our skeptical age. Gordon Mathews is Lecturer in the Department of Anthropology at the Chinese University of Hong Kong.